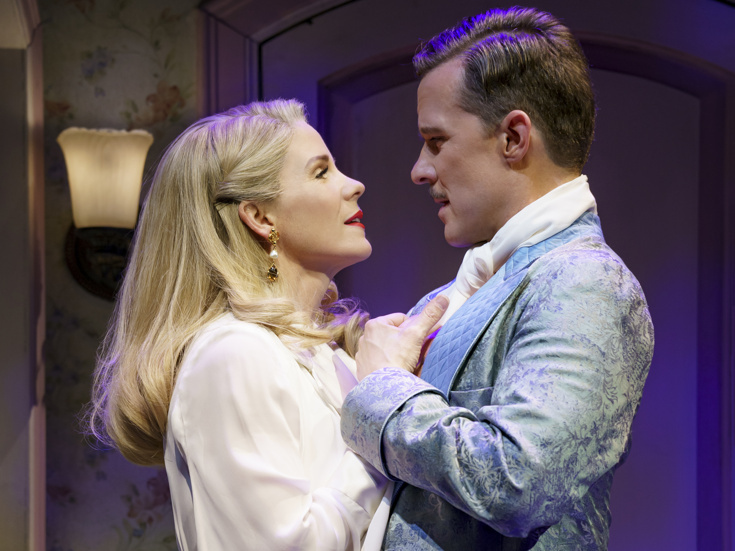 Kelli O'Hara & Will Chase in "Kiss Me, Kate"
Wunderbar! The celebrated new Broadway staging of Kiss Me, Kate has received a four-week extension at Studio 54. Originally announced to run through June 2, the Roundabout Theatre Company production will now wrap up its engagement on June 30. With a score by Cole Porter and a book by Sam and Bella Spewack, newly revised by Amanda Green, Kiss Me, Kate follows a cast putting on a musical version of William Shakespeare's The Taming of the Shrew and the conflicts on- and off-stage between Fred Graham (played by Will Chase), the show's director, producer and star, and the leading lady, his ex-wife Lilli Vanessi (Kelli O'Hara). Joining Chase and O'Hara in the cast is Corbin Bleu as Lucentio/Bill Calhoun, Stephanie Styles as Lois Lane/Bianca, Terence Archie as Harrison Howell, Mel Johnson Jr. as Harry Trevor/Baptista, Adrienne Walker as Hattie, James T. Lane as Paul, John Pankow as Gangster (First Man) and Lance Coadie Williams as Gangster (Second Man). The ensemble features Darius Barnes, Preston Truman Boyd, Will Burton, Derrick Cobey, Jesmille Darbouze, Rick Faugno, Haley Fish, Tanya Haglund, Erica Mansfield, Marissa McGowan, Sarah Meahl, Justin Prescott, Christine Cornish Smith, Sherisse Springer, Sam Strasfeld and Travis Waldschmidt. Directed by Scott Ellis, choreographed by Warren Carlyle and music-directed by Paul Gemignani, the production began previews on February 14 and officially opened on March 14. Kelli O'Hara stars in the Broadway revival of this classic Cole Porter musical.